Flowers are the reproductive parts of flowering plants. A flower is a special part of the plant. Flowers are also called the bloom or blossom of a plant. Flowers have petals. Inside the part of the flower that has petals are the parts which produce pollen and seeds. 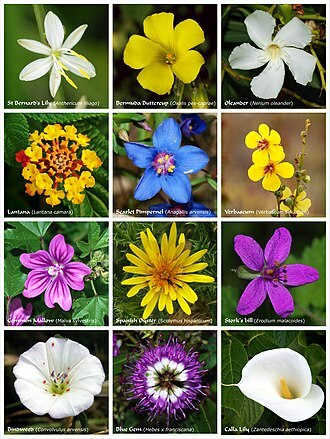 In all plants, a flower is usually its most colourful part. We say the plant 'flowers', 'is flowering' or 'is in flower' when this colourful part begins to grow bigger and open out. There are many different kinds of flowers in different areas in the world. Even in the coldest places, for example the Arctic, flowers can grow during a few months. To investigate the structure of a flower, it must be dissected, and its structure summarised by a floral diagram or a floral formula. Then its family can be identified with the aid of a flora, which is a book designed to help you identify plants. Although this arrangement is typical, plant species show a wide variation in floral structure. The modifications produced in the evolution of flowering plants are used by botanists to find relationships among plant species. Flowers are an important evolutionary advance made by flowering plants. Some flowers are dependent upon the wind to move pollen between flowers of the same species. Their pollen grains are light-weight. Many others rely on insects or birds to move pollen. Theirs are heavier. The role of flowers is to produce seeds, which are contained in fruit. Fruits and seeds are a means of dispersal. Plants do not move, but wind, animals and birds spread the plants across the landscape. Since the ovules are protected by carpels, it takes something special for fertilisation to happen. Angiosperms have pollen grains comprising just three cells. One cell is responsible for drilling down through the integuments, and creating a passage for the two sperm cells to flow down. The megagametophyte is a tiny haploid female plant which includes the egg. It has just seven cells. Of these, one is the egg cell; it fuses with a sperm cell, forming the zygote. Another cell joins with the other sperm, and dedicates itself to forming a nutrient-rich endosperm. The other cells take auxiliary roles. This process of "double fertilisation" is unique and common to all angiosperms. Flowers are modified leaves possessed only by the flowering plants (angiosperms), which are relatively late to appear in the fossil record. The earliest known fossils of flowers and flowering plants are from 130 million years ago, in the Lower Cretaceous. The flowering plants have long been assumed to have evolved from within the gymnosperms; but the known gymnosperms form a clade which is distinct from the angiosperms. It has been concluded that the two clades diverged (split) some 300 million years ago. An example of a 'perfect flower'. This Crateva religiosa flower has both stamens (outer ring) and a pistil (centre). ↑ Crepet W.L. (2000). "Progress in understanding angiosperm history, success, and relationships: Darwin's abominably "perplexing phenomenon"". Proceedings of the National Academy of Sciences 97 (24): 12939–41. doi:10.1073/pnas.97.24.12939. PMC 34068. PMID 11087846. http://www.pnas.org/cgi/reprint/97/24/12939. ↑ Nam, J.; Depamphilis, CW; Ma, H; Nei, M (2003). "Antiquity and evolution of the MADS-Box gene family controlling flower development in plants". Mol. Biol. Evol. 20 (9): 1435–1447. doi:10.1093/molbev/msg152. PMID 12777513. http://mbe.oxfordjournals.org/cgi/content/full/20/9/1435. This page was last changed on 28 January 2019, at 22:24.